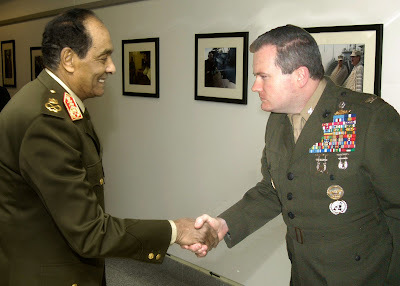 The UNETIDA/UNPASID Director of Intelligence Colonel “Whopper” Creedon met recently with General Abdel Fattah al-Sisi the commander of the Egyptian Armed Forces/Minister for Defence now also Deputy Prime Minister who in July took part in an unscheduled change in government to oust President Mohammad Morsi from office. Creedon was visiting the joint UNETIDA/UNPASID “Anubis Bunker” near Giza, and wanted to affirm the facility’s importance to the General during his country’s "time of transition". It is believed Creedon was sent because both officers are charismatic, telegenic and enjoy a "cult of personality" in their respective spheres of influence as well as being prone to passionate speeches. They have much in common as they both attended top level military schools in the U.S., both were the heads of intelligence for their respective organisations and each have been directly responsible for the deaths of over a thousand people in one event - al-Sisi for his clearing of the Muslim Brotherhood sit-ins and Creedon for his accidental remote detonation of a UNETIDA "PLAN-Z" device in a suburb of Paris over a decade ago. 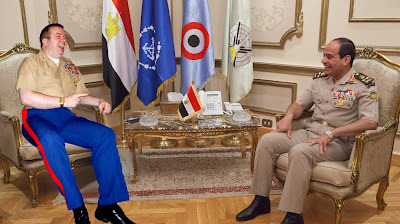 General al-Sisi underscored his desire for peaceful resolution of the ongoing protests, and reiterated commitment to supporting UNETIDA/UNPASID's continued presence in Egypt as well as the mission of the Anubis Bunker. The Anubis Bunker is a facility designed to monitor, combat and contain a higher than planet-normal degree of both Extra Terrestrial and Paranormal activity in the area of the Great Pyramids and is celebrating it’s 40th anniversary of operation this month. Hope you didn't go telling him he wasn't being heavy handed enough. Especially since his predecessor was removed from office following the Tahir Square massacres not long after this photo was taken.